At April’s apartment, Leonardo’s badly beaten body (freshly flung through the window) has delivered a grim message: The Shredder is back! Right on cue, a horde of Foot Soldiers come smashing through the windows and attack. The Turtles spring into action as April and Splinter try to get the nearly unconscious Leo to the door. Dodging arrows and other hazards, they eventually make it. But when April opens the door, a clawed Foot Soldier lunges at her. With his last ounce of strength, Leo slams the door on the ninja, knocking him out. Leaving Raph behind to cover their rear, Mike and Don clear out the stairwell of the Foot Soldiers hidden beneath the steps. Raph takes out the remaining Foot Soldiers in the apartment and then joins his brothers downstairs. Slowly, they enter the 2nd Time Around shop, but find an old friend waiting for them. As Foot Soldiers crawl from every corner, the Turtles look doomed. At least until their cavalry arrives in the form of Casey Jones! Casey and Raph immediately double-up and begin mowing down the Foot Soldiers in their way. April and Splinter carry Leo over to the fire exit, only to find it sealed from the outside. April tells Splinter that there’s a secret way out and they begin moving toward it. Meanwhile, Casey manages to land a kick on Shredder just as another unit of Foot Soldiers drop down through a hole in the ceiling. As Casey works on them, Raph and Don hold the Shredder at bay. April leads Splinter to an old walk-in cooler from when the 2nd Time Around shop used to be a grocery store. There’s a sloppily covered hole in the wall where the freezing unit was removed that can be used for escape. As the building catches on fire, police cars begin to converge on the scene. 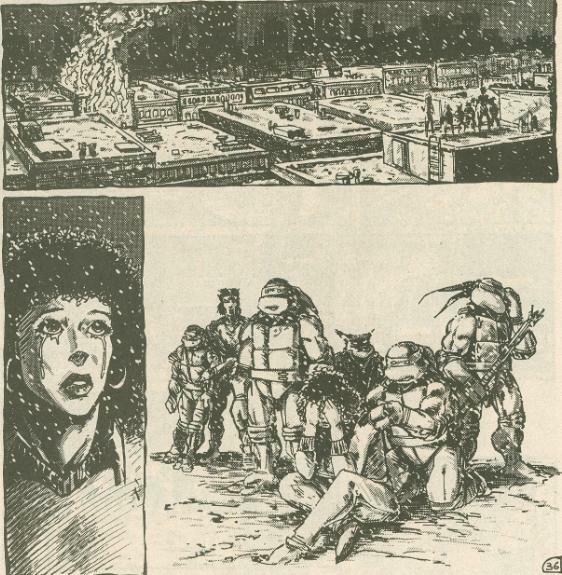 While the Turtles escape, Shredder assures them that the war is far from over and orders his ninja to vanish. Escaping into the alley, the Turtles decide to leave April’s van behind and proceed on foot. From a rooftop, April breaks down sobbing as she watches her father’s store burn. 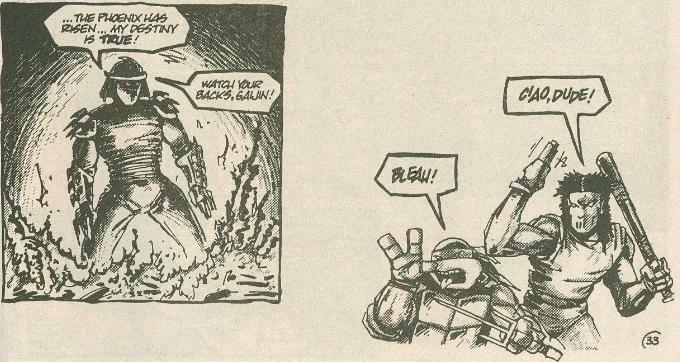 Epilogue: On the highway, Casey tows a U-Haul trailer containing the Turtles and Splinter. In the car, April worries about Leo’s health. Casey assures her that they’ve almost reached their destination as he turns off on the Northampton exit. *This story is continued from Leonardo (microseries) #1. The story continues in TMNT (Vol. 1) #11. *The Shredder will return in TMNT (Vol. 1) #21. 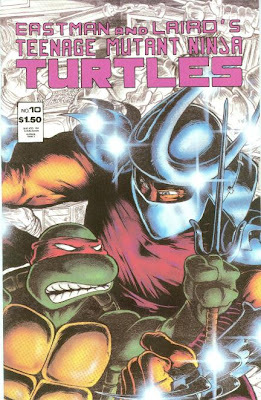 *Casey Jones first appeared in Raphael (microseries) #1. How did he know where to find the Turtles? Apparently, according to story notes from Peter Laird, that was CASEY spying on April and the Turtles back in TMNT (Vol. 1) #4. *Torchy's (the bar Casey claims to have worked at) will appear in Tales of the TMNT (Vol. 2) #37. *The Second Time Around shop will be revisited in TMNT (Vol. 1) #59. *This issue also contained a bonus pin-up of the TMNT meeting Equine the Uncivilized by Richard Konkle and Jim Groat, a 2-page spread advertising Tales of the TMNT and a bonus pin-up of the Shredder. *For the 2009 TMNT Vol. 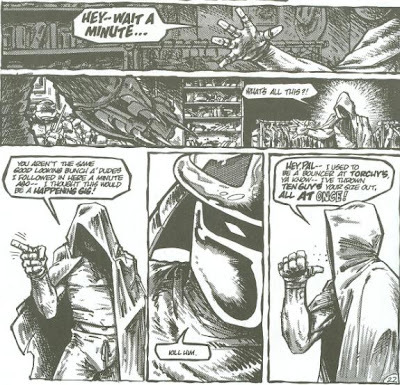 1 collected edition published by Mirage, the 3-page fold-out spread was reduced in size to fit onto two pages (the bonus pin-up of Shredder, originally included to fill the back of the middle page of the fold-out, was then included on the following page in this edition). *CHET ALERT: Page 37, a truck labeled “Chet Van Lines” can be seen on the highway. “Chet” was an in-joke included by several members of the Mirage staff because… they just liked that name! This two-issue arc is one of my all-time favorites in the entire Mirage TMNT library. It’s the result of several plot threads that have been building up since the first issue, it moves fast and furious, it has a very atypical ending and, best of all, it focuses on the return of both the Shredder and Casey Jones! It just doesn’t get much better than that. “Silent Partner” is a great example of just how powerful and competent the Foot Clan can be when they have quality leadership and intelligent strategy. Six issues ago we saw that the Foot were stalking April and the Turtles and now we finally get to see them put all their recon to good use. First, they take out the most skilled Turtle while he’s alone, thinning their enemy’s ranks, then they corner the rest in an enclosed space with few exits, catch them off-guard and slowly wear them down by sheer numbers. And if it weren’t for a convenient plot contrivance, they would have succeeded, too. It’s a stark contrast from how the Foot will generally be portrayed for the rest of the series; more as annoyances to the TMNT than genuine threats. Of course, the book offers reasoning for their future ineptitude (disorganization and lack of leadership), but it’s still a bit disheartening to know that after this arc, there glory days will pretty much be behind them until “City at War”. And even that storyline focuses on the “embarrassing ineffectuality” of the Foot as a plot point. So if you want one of the best Foot-related stories that really shows how good they can be as enemies, then this two-issue arc is the best place to stop. Once more, Kevin Eastman’s action layouts are stunning and there’s so much speed and energy to the battle choreography that it nearly pops off the page. 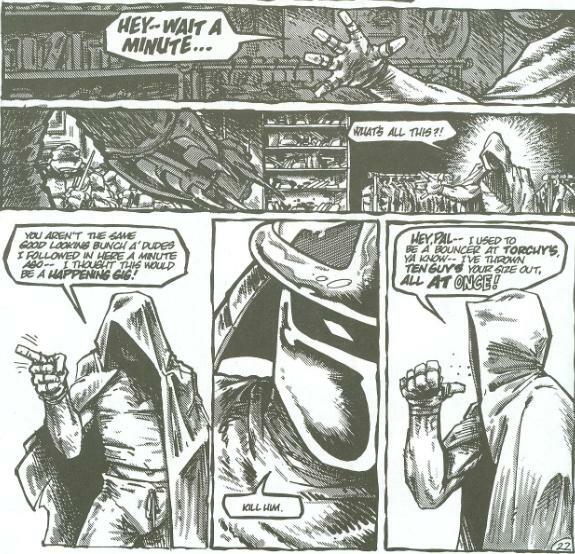 Eastman has a talent for finding that perfect middle-ground between the compressed action of Western comic storytelling (20 panels to a page as characters give lengthy dissertations as they battle with accompanying narrative boxes redundantly repeating everything they’d just said) and the decompressed action of Japanese manga storytelling (7 pages of characters standing and staring at each other, grunting and twitching and by the time the first punch is thrown the issue is over). The action flows from page to page with limited dialogue to interrupt the momentum and you definitely get to savor every kick and punch. But the plot never slows down, either, and moves right along with the action. 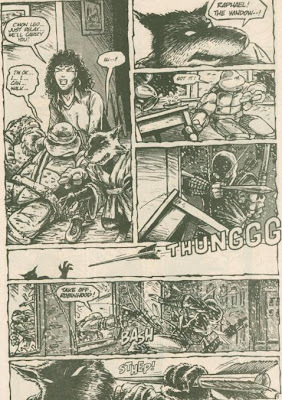 Rather than two pages of “hey, look at how cool it is to see Splinter catching an arrow and the Turtles tossing the bowman through the window”, the action occurs simultaneously with the conflict of getting the unconscious Leo out the front door, illustrating just how chaotic the entire sequence is. Everyone gets a moment to shine in this issue. Well, except for April, who is still the useless, simpering sadsack she’s been since she first appeared. Splinter immediately takes charge as the Foot invade the apartment and the aforementioned scene where he catches the arrow was pretty great. I really liked Don and Mike’s scene where they lure out the Foot Soldiers beneath the staircase because it shows how clever, resourceful and highly-trained they are while still infusing the moment with a dose of humor. And, of course, we get the Casey Jones/Raphael team-up. Casey’s big “comeback” was one of my favorite moments, partly because he’s my favorite character but also because, when I first read the issue, it came as a definite surprise. Yeah, it opens up questions as to “how did he sneak in there?” and “so, what, he just happened to be walking past the shop at just the right time and just happened to see ninjas running around?”, but who cares? It was awesome. The Shredder’s big return comes in the form of a badass three-page fold-out, and nothing says “epic” like a three-page fold-out. Both Casey and Raph manage to get some licks in on him during the fight, and I’m a bit conflicted on how I feel about that. I sort of like the Shredder best when he’s presented as this monstrously powerful, nigh-unstoppable villain and seeing him shoved around during his big return sort of takes away from that. Of course, he already died once and blew himself up like an oaf, so he’s already lost some cred at this point in the narrative, anyway. And seeing Casey land a kick in his stomach was great, I’ll concede. A nice illustration of how capable a fighter Casey is without being a highly-trained ninja master like everybody else. When the 4Kids cartoon reduced him to a bumbling comedy relief sidekick, I just about stopped watching the show. 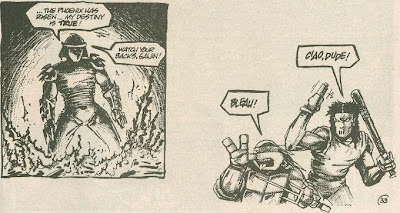 This two-part arc is one of the best storylines from any TMNT comic, with an ending that’s definitely out of the ordinary (the good guys get their asses handed to them). It’s probably my second favorite story arc, in fact, just after “Return to New York”. This issue contains probably my favorite Splinter and Casey Jones moments. I will give the 4Kids adaptation the edge on one small point though... Casey's entrance through the window on a motorcycle = WIN! I agree, I think there are little tid-bits that were done slightly better in the other tellings of the story. I like the "falling through to the 2nd Time Around" myself from the 1st movie. The Foot using freakin' axes was epic! I think that I love this story arc the most out of the entire tmnt universe (at least in the Mirage vein) because it does an excellent job of defining true heroes and true villains. Especially in a time period (the early 80's) when heroes could be any idiot lucky enough (or tragic enough) to be exposed to toxic waste or radiation. I also love the competent and surprisingly terror-inducing shredder (who i love way more than the stumbling buffoon we get in the Archie series and 1980s TV show); who i believe does an equally awesome job of being that other side of the coin, to give the story balance and substance. After all what is a Heroic hero with an equally villainous villain. Love the site by the way mark, keep up the good work. The 87 Casey Jones came the closest this comic book version. The 03 version was a useless weak love interest. The Shredder from the 87 series started out as dangerous, but like so many cartoon series and films in the early 90s, parent groups were complaining about violence and TMNT and others had to put up with this for a time. It wasn't until the Red Sky season did the show go back to having a darker edge.